Johnathan Behr Bespoke Clothiers. Entering Mr. Behr’s showroom is like entering a well appointed drawing room complete with upholstered armchairs with fabric covered books. I sat down for an interview asking him to guide me through on how he produces traditional bespoke suits. First choose from the material options, it’s almost limitless. Being in LA, many fabrics are lightweight, fantastically soft wools cause of the warm climate. Detailed measurements are taken and a paper pattern made. Once the pattern is made and fabric cut a second appointment is made for “The Basted Fitting”. The fabric has been basted (loosely sewn) together. During this period more fine adjustments are made to the suit. During the third visit the suit is taking on its final shape. The final alterations are made. The last visit is for pick up. The entire process takes three to five weeks for a suit that will last a lifetime. What is the meaning of the word “Bespoke”? Typically it’s always been used to describe the finest kind of tailoring as bespoke tailoring. It’s mostly, if not all, done by hand. It requires the making of a personal pattern and it requires the numerous fittings to refine that personal pattern so that’s why it’s just been geared towards men’s suits and fine tailoring. The origin of the word is bespoken. It’s spoken for. When a guy would go in to a tailor shop in London and he’d pick a cloth, they’d put that cloth aside, okay, that’s spoken for, it’s „bespoken for“. Has American style had any lasting impacts on elements of men’s clothing? I’d say absolutely. It’s stronger than ever right now. The American aesthetic, the simplicity of it, the classic lines, your kind of east coast traditionalism was refined by companies like Brooks Brothers and J. Press. It’s gone away from the glitz of Claude Montana and Gianni Versace. The big designers of the last few years, Thom Browne is a great example, are all about east coast traditionalism, the preppy Ivy League Look or “ivy style”. I would say American style has had a really big comeback. You’ll see simplistic cuts from designers like Prada that look like an ivy league sack suit. Are you seeing any new twists on traditionalism this season? The Tartan and bigger plaids have started to make a resurgence. I see stars like Justin Timberlake wearing it. He’s wearing tartans and big houndstooth checked suits. Do you think bespoke is becoming more popular? Those days where everyone coveted having an Armani suit are gone, what guys are coveting now is a bespoke suit. The fashion magazines have really promoted that the highest end of suiting is having something made for you, having a bespoke tailor. Once a guy goes bespoke he doesn’t go back. You see a lot of icons like David Beckham and he gets everything made on Savile Row. So they look at people like that, they look at your George Clooneys and Daniel Craigs and they’re definitely getting suits made for themselves; I think that has a big impact. So find a good tailor and build that relationship, you’ll never get a better suit, you’ll never get a better fit. 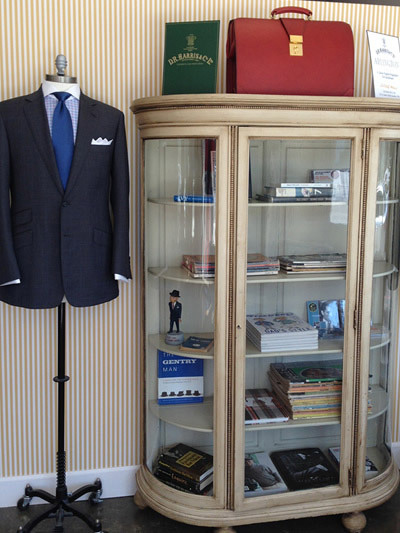 What’s exciting is the younger generation is interested in getting suits made. It’s become very cool to get a bespoke suit. To be able to pick your fabric, your lining, to have the cut exactly like you want. The trend is obviously towards a very slim fitting suit. And in order to get that slim fit you have to have a really fitted suit so you’ve got to take in every little bit of fabric and that requires a tailor. I think suits got really baggy. There had to be a reboot. Thom Browne redrew silhouettes. And of course, Mad Men had a huge impact on what people think is cool now and hip to wear. I know you did a few suits for Mad Men. How did you like the experience of working with a costume designer who had very specific ideas? I found it very easy because I understood the language she was speaking. I understand the look that she wanted. I watch a lot of classic movies and tv shows. I love stuff from the 50’s and 60’s. Did you do one of Don Draper’s suits? I did Don Draper’s tartan plaid and then I made two three piece suits for Sterling. Do people still wear a lot of three piece suits? Yes, very popular! The beauty of a three piece suit is when a guy takes his jacket off. He looks tailored. The vest keeps the shirt from billowing out and you have the fabric of the suit up against your shirt and tie and you just look very tailored and very natty. It’s a very commanding, powerful look. I love them. I recommend them to most clients. A big trend has been to wear a really elegant dark suit in a midnight blue or a black for your wedding, as opposed to wearing a tux. At the reception they can take their jacket off but they still look tailored. That’s the beauty! It looks great with French cuffs when you’re wearing a vest; it looks really elegant. And a three piece suit has a way of slenderizing the whole torso. Is there a silhouette you consider to be inherently Los Angeles? I think L.A. is the town where it became cool to wear a tee shirt and a sport coat and a pair of jeans. If L.A. has one thing it’s the dressing down of the jacket and the suit but still making it cool. Wearing a nice cashmere jacket and black tee, throw on a pair of jeans and a nice pair of loafers and is great look. I think that’s one of the great things that L.A. has brought, that you can still have a great jacket on but that you can wear it in a total unfussy, formal way. Do TV and Film play a role when have a man’s suit made? I think they do. I just had a guy who wanted to look like Ryan Gosling. He said I know you’re not going to make me look like him but this is the suit I like. So Ryan Gosling, he’s definitely an icon, James Franco, Clooney of course, Daniel Craig’s big. And then Cary Grant still to this day. He still has a big impact on the way men dress. People just love the way he looked. He’s kind of the standard. I think clothes do make a man. I get projects all the time. I have to make guys look a lot better than they look. When you get a guy that maybe doesn’t have the best bod, or he’s not very tall or he’s not the most handsome looking guy, but if you put him in a beautiful suit all of a sudden he’s a lot more handsome. Your eye isn’t going up to the flaws in his face, you’re looking at how he’s put together. So I do believe clothes do make the man, I really do. People look at you, that first impression is so important. Style should be quietly. it shouldn’t be in your face. But when it’s done right and it’s done quietly it’s kind of like wow! Look at that! Maggie Cone is a Los Angeles contributor to The Glare.